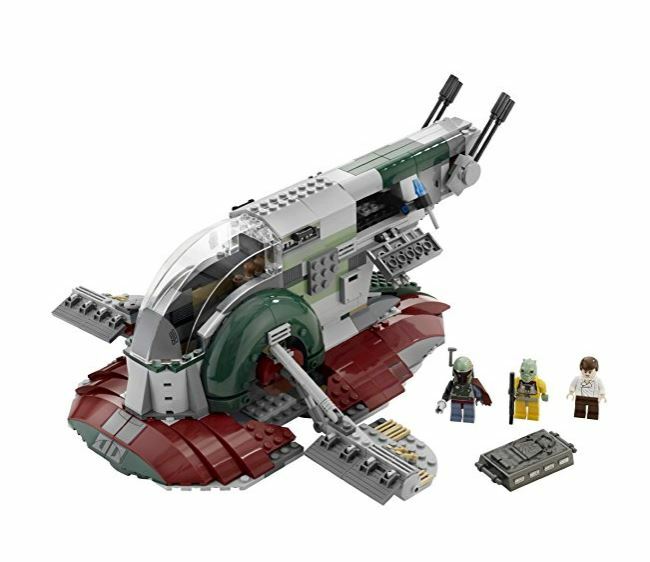 Lego released the Lego Slave 1 8097 set, dedicated to Boba Fett and his mission of capturing Hans Solo and bringing the captive to meet Bossk, the Trandoshan hunter. Aboard his spaceship Slave 1, Boba Fett transported Hans Solo while a mission of finding Hans Solo and the Millennium Falcon crew. Next to Dart Vader, Boba Fett is one of the most famous villains in Star Wars. He was chosen by Empire magazine as one of the 100 Greatest Movie Characters on 2008. His background on being a bounty hunter made him an apparent ally of Darth Vader. In Star Wars Episode VI: The Empire Strikes Back, Boba Fett’s bounty hunting was put to the test by Dart Vader. The set has three minifigures included: that of Boba Fett, Hans Solo, and Bossk. You will find that these versions have much more detail on them. Lego has produced a much better Boba Fett this time, complete with a new blaster rifle. Boba’s helmet and body have been painted well. Hans Solo’s paintwork is also impressive with the accurate colors for his brown pants and white shirt. Throw in Bossk, and you can review the scenes in the old movie episodes! One of the most iconic battleships in the Old Trilogy is Slave 1. Lego came up with a battleship with darker colors. The dark red paint on the body of the ship is more dominant. It has four flick-fire missiles on the front of the vessel and a secret compartment at the back where two other manual weapons are hidden. There are lockers and big guns to make this ship more formidable. Even the underside of the ship has improved in terms of details so you will enjoy this battleship than the earlier versions. Hans Solo was trapped in a chamber fastened under the ship. The room fits perfectly on the underbelly of the space ship. Also, Hans Solo fit well inside his carbonite chamber. For my son’s 4th birthday, I was planning to give something different which can introduce him to the world of adventure games. 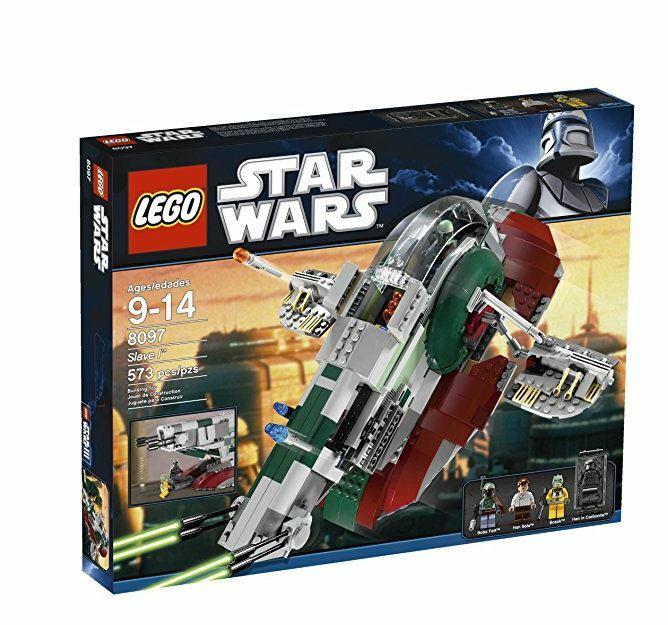 I started researching online and then saw on Amazon the LEGO 8097 Star Wars Slave 1 Version 2010 building set. The character of Boba Fett is undoubtedly one of the famous and dam cool characters which belong to the Star Wars universe. In my research, I discovered that it will be an excellent set for my son’s entertainment. When the product reached me, I didn’t miss the chance to join my son in building LEGO, love Star Wars. My son loved the detail of this set. What actually attracted me personally are the unique features of movable turrets as well as concealed missiles. When we opened the pack, the toy seemed bit fragile, but in reality, they are not that much. It’s pretty safe if you are playing on the bed or on a large table as chances of fall out and breakage will be less. The set detail is excellent, with some scale issues which can easily be ignored. The Star Wars Slave 1 Lego set is complicated enough to make it a fun love activity. The quality of the mini flags is excellent. The detailing of all the mini figures is done with absolute perfection. This set for me as a parent is a perfect choice for a kid over 4 years. The game is quite thrilling, entertaining and an ideal choice for a youngster. Putting together all 573 pieces actually helps the child to think beyond regular capacity. I strongly recommend this set for kids above 4 to 5 years ago. The 573-piece Lego set is a great collector’s item. You can relive your Star Wars battle scenes with the minifigures, ship, and working missiles. The colors are well-thought-of and bring out the characters from the movie to life. It’s a definite must-have in every Star Wars collector’s shelves alongside the SSD set. Lego did justice to all the movie figures and the battleship itself so owning Lego’s Boba Fett Set 8097 is definitely a must!